It’s the way news often works in Washington, DC. Politico ran a story yesterday that in light of a recent health scare Supreme Court Justice Ruth Bader Ginsburg went through, only stated the obvious —”Trump White House urging allies to prepare for possible RBG departure.” This gives reporters and columnists a chance to revisit last year’s vicious assault on now-Justice Brett Kavanaugh and anticipate an even uglier confirmation battle if Ginsburg leaves the High Court while Donald Trump is president. In case you haven’t followed what Politico describes as the “ailing Supreme Court Justice,” on December 21 Ginsburg had surgery (a pulmonary lobectomy) to remove two cancerous growths from her lungs. What moved the discussion from the background to the foreground is that this week Justice Ginsburg missed oral arguments, something that has never happened in her 25 years on the Supreme Court. In a statement the Supreme Court said there was “no evidence of any remaining disease,” but this is not the justice’s first serious health scare. 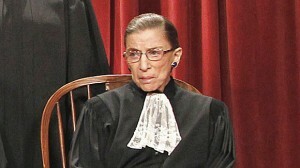 “Ginsburg has also battled cancer twice before. In 1999, she was treated for colon cancer, and in 2009, she was treated for pancreatic cancer,” The Washington Examiner’s Melissa Quinn reported. her departure from the Court would allow Trump to nominate a third Supreme Court justice — the most in one presidential term since President Ronald Reagan placed three judges on the highest court during his second term. has become a cause of concern because of her remarkable past attendance streak, which persisted through two previous cancer treatments and a number of other health scares. At the outset of oral arguments on Monday, Chief Justice John Roberts said she was “unable to be present” but would participate in the cases nonetheless, reading briefs, filings, and a transcript of the sessions.